On the template this time, we make a variety of colors for the display brightness in your presentation. Coupled with a charming artistic make your template becomes more beautiful. Combined with bright colors, also increase the brightness in your template. 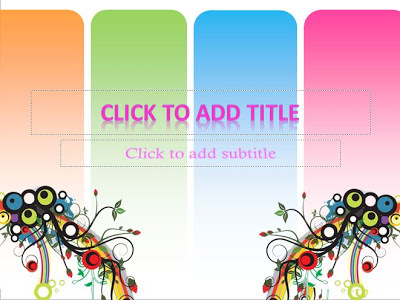 The color orange, green, blue and purple indicates that the template is suitable for a unformal presentation. Four colors were a major background in this template with gradations of color on the bottom. It was made in order to make the colors in the background is not too flashy. With it, the title and sub ​​title of your presentation is more clearly visible. Because in this template letters tend to be colored purple. you are interested in this template? let’s download at the link provided.